And so we have come, for the second time, to the dying days of the 1795 storyline. Barnabas Collins, the once-and-future vampire and self-appointed timecop, has taken it upon himself to rescue girl governess Victoria Winters from the natural consequences of her deeply flawed life decisions, and all that remains is for him to re-penetrate the barrier of time and space, and get back to the rest of us, here in 1969. The problem is, he didn’t arrange for a ride home, and for some reason his time travel app isn’t working. Yes, he tried standing in a graveyard, staring into space and yelling at Julia, obviously he did that, duh, it’s the very first thing he thought of. It just didn’t work. So he’s booked a trip to the future the old-fashioned way, by sealing himself up in a tomb and waiting for a wake-up call. And then along comes mere anarchy loosed upon the world, in the form of two amateur vampire hunters, wielding a hammer and stake. It’s your typical buddy cop scenario, a tough-as-nails French countess partnering up with a cocky young Naval lieutenant who doesn’t play by the rules. 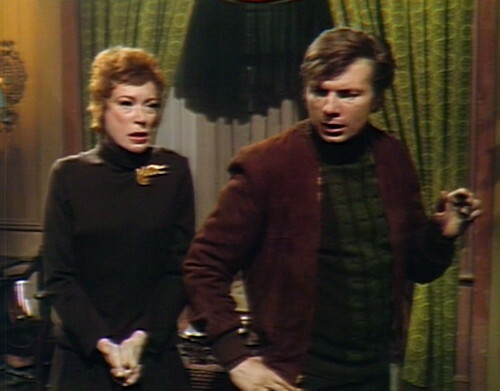 But it all works out okay, in the sense that Barnabas’ servant Ben murders Natalie and Nathan and buries them in shallow, unmarked graves, which is the only way that anybody on Dark Shadows ever solves a problem. This is helpful, because originally Natalie survived this storyline, and if you’re in the make-believe Shakespearean tragedy biz, then you want to inflate the body count as much as you can. It’s just one more corpse on the pile, but every little bit helps. Meanwhile, 173 years later, it’s nearly 7:30pm. This is about as far as you can stretch the word “meanwhile” without snapping it in half, but Dr. Julia Hoffman is an all-state narrative wrestling champion, and she hasn’t lost a match yet. She was with Barnabas when he hitched a ride to the late 18th, and he told her that he’d try to come back the next night at 8:00 sharp. They both seem to be under the impression that they can synch up their timelines if they show up at the same spot at the same time of day, and apparently on Dark Shadows anything you say about time travel is automatically true. 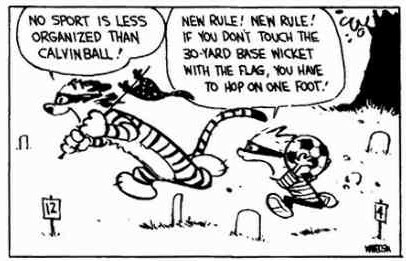 We are playing nothing but Calvinball these days. Then she gives him another in her endless series of significant looks. And if you ever need a significant look to drive home a lunatic plot contrivance, then Julia is the man for the job. 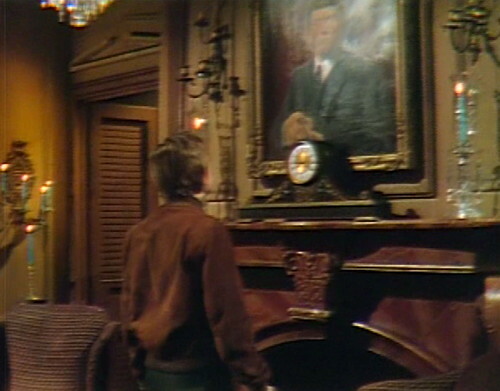 As Julia hurries away to her appointment, Willie looks at the portrait of Barnabas, and he does something that Dark Shadows characters almost never do: he remembers something that happened more than six months ago. Willie (thinks): You can’t tell me about Barnabas, Willie. Not one thing. You remember the night you went to the mausoleum hunting the jewels, huh? You remember that first night? Yeah, and his hand… His hand came out of the coffin and grabbed you? Well, you didn’t believe that while it was happening. But it did, Willie. Maybe you can’t go back in time, but Barnabas? Barnabas isn’t like anyone else! Willie has started addressing himself in the third person pretty much full-time by now. I don’t think there’s anything we can do about it. But there’s an interesting trend towards developing a long-term memory for the show. 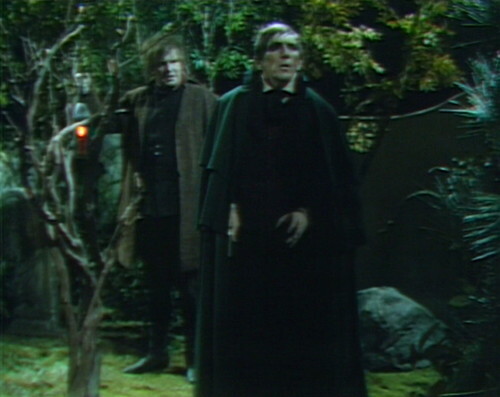 This week’s trip back to 1795 has been all about reminding people of the good old days of last April, back when Barnabas was a vampire and the show made some kind of basic sense. Now Willie’s rewinding even farther, all the way back to the very first episode of the show, when he opened up the mystery box. Anyway, while we’ve been dawdling, Julia’s been out here on the moors, arching her eyebrows as far as they can arch, and launching text messages into the atmosphere. This is one of those fruitless ghost-communication Garfield Minus Garfield situations, where all we hear is Julia’s side of the conversation — but Barnabas was doing the same thing on Friday from the other direction, so here’s what it would sound like if you mixed them together. Can’t you feel me willing you back? Hear my voice echoing through the centuries! Hear me, and draw me to you! Draw me forward in time! Let me return to you! Hear my voice! Hear me! It doesn’t work, obviously, because it’s not enough if Julia is the only one clapping her hands. The kids in the audience have to help, too. And so, continuing the parade of magical thinking, Willie suddenly decides that Barnabas must have given up on the graveyard, and found another way home. He pitches his idea to Julia, who gives him a remarkably honest assessment. Willie: Hey, Julia — what if he comes back the way I found him? You know, in the mausoleum, in the secret room? Well, why not? Julia: Because he told me to meet him at the grave. Willie: Yeah, Julia, but maybe he didn’t know! Maybe he thought it was that way, but it wasn’t! Julia: Willie, that makes no sense! Willie: Well, I don’t care if it does or it doesn’t, I’m gonna go to the mausoleum anyway! And look at his little face, all lit up like a Christmas tree. This is what it looks like when you believe in fairies. Willie can’t wait to get out there, and defile the dead. Dark Shadows has invoked its past — both 1796 and 1967 — in order to banish it completely. It’s time to pop open the mystery box, and loose whatever’s in there that needs loosing. We can bring Barnabas back to life, powered by our belief in candles and costumes and Chromakey. Clap your hands, boys and girls, and raise the dead from their slumber, just one more time. Tomorrow: Take the Actors, Please. When Ben shoves Nathan against the wall, the mausoleum wobbles. Ben has a little trouble closing the coffin lid on Barnabas. They need Grayson Hall to play Natalie in the mausoleum scene in act 1, and playing Julia immediately after. They must have pretaped the first scene, which gave them more freedom to edit the tape. There are at least three edits in the scene. After the first edit, Natalie says “You killed him!” a second time. When Willie notices that the tombstones are gone, there’s a branch dangling in front of his face. After about ten seconds, he brushes the leaves away. There’s another lighting problem today. 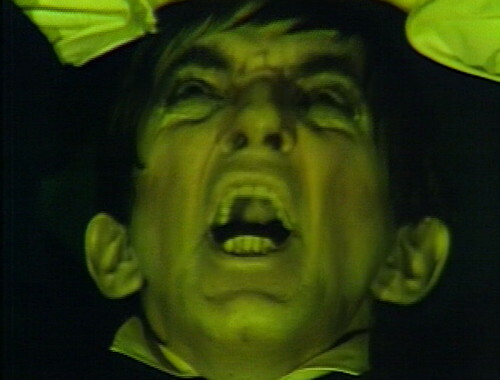 When Barnabas is doing his “I feel the need for blood” routine, his face is in shadow. There’s a candelabra with blue candles in the mausoleum’s secret room in 1796. When Willie comes look in the coffin, the candelabra is still there. I don’t think we’ve seen it before in the present day, but time is all screwed up at this point. The camera moves a couple times during Josette’s appearance, which makes the Chromakey effect a bit silly. When Willie sees Josette’s ghost, Julia is waiting at the top of the stairs, waiting for her cue. The camera’s at the wrong angle, and we can see the bottom of her skirt peeking into the frame. The camera operator notices the problem a couple seconds later, and the camera adjusts. Josette’s ghost is played by Natalie Norwick, a background actress who appears in six episodes. 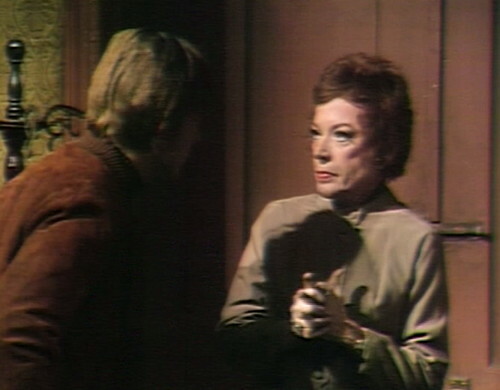 We last saw her in June 1968, when Josette’s ghost sobbed in front of the basement wall where Barnabas was entombed. We’ll see her again in March, when she subs in for Edith’s hands. 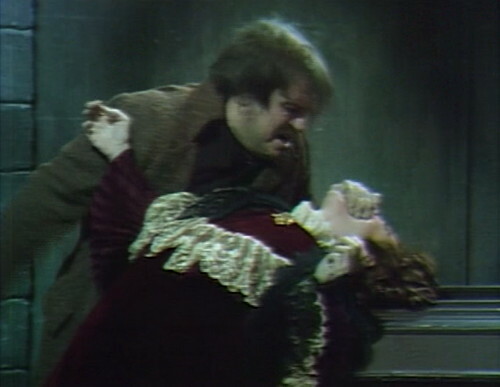 Florence Stanley did the sobbing they use for Josette’s ghost; this is the fourth and last time this recording was used. Stanley’s crying first appeared in episode 4, in June 1966. 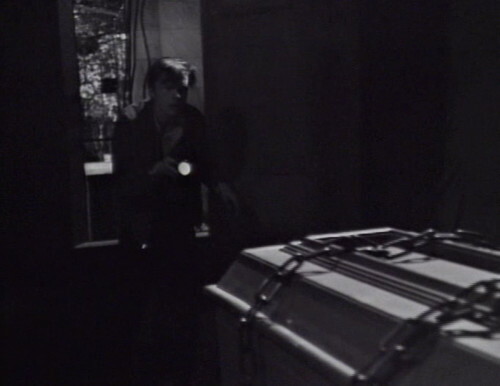 In this episode and later when Barnabas returns to 1897, he is depicted as “awake” in his chained coffin and trying to escape. I guess this is just an aspect of the time travel, because the general assumption is that he was in some sort of suspended animation until Willie opened the coffin. Joshua says as much in the last episode of 1795. I also like how the writers decided to basically make Willie a modern-day Ben with only a few minor tweaks. It makes no actual sense, as Barnabas, when human, was kind to Ben and developed a true friendship, which is not the relationship we saw between him and Willie in 1967. But I think they realize that a “vampire support system” of a Renfeld and a doctor who’s in love with him works better narratively. 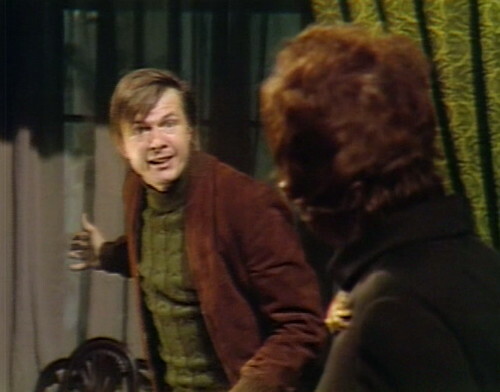 The unlikely change in Barnabas’ treatment of and overall demeanor toward Willie probably has more to do with John Karlen’s as well as Jonathan Frid’s fan mail than anything else. During his 1969 Merv Griffin appearance Frid relates how in a fan letter he was once chided by a young viewer who thought he shouldn’t be so mean to Willie because he’d heard Willie saying some nice things about him recently. Likewise, the fact that the Julia Hoffman character survived beyond the thirteen weeks that was originally planned was because of the volume of fan mail that began pouring in for Grayson Hall. Otherwise, if writer Joe Caldwell had had his way, she would have been upended into a vat of acid courtesy of Barnabas in revenge for having botched the vampire cure experiment that wound up aging him. Unlike others in the business, Dan Curtis was a guy who made casting decisions based on the graffiti etched by fans on the wall outside the television studio. I don’t actually like the idea of Barnabas sleeping through the ages. He’s a bloodthirsty immortal creature chained up in a box to slow down his brutal mass murder spree. It doesn’t have to be pleasant. I think he woke up every evening and tried to claw his way out. For Willie — yeah, the audience liked him, and the idea of a Barnabas/Julia/Willie “family” exerts a gravitational pull. If we need an in-universe explanation, then how about: He was beaten, tortured and forced to do terrible things for six months, and then locked up in a sanitarium. Upon his release, he was forced back into service under threat of being locked up for the rest of his life. Willie has created a sentimental fantasy past for himself, to help him survive in this supernatural murder cult that he’s trapped in. Brilliant theory, DH. Of course, Willie isn’t the only one creating a sentimental fantasy to survive a supernatural murder cult. That’s why I read Dark Shadows Every Day. Kudos for using both “666” and “The Second Coming” in the same post title! It’s fitting that Florence Stanley had a small part on the show, since Abe Vigoda also did, and they later played one of the great sitcom couples, Phil and Bernice Fish on BARNEY MILLER. Of course, she did a lot of other voices, and things like FAMILY GUY and the sitcom DINOSAURS. I love the return to Calvin&H. Sadly, this is our last glimpse of Joel Crothers on DS, too. But he left as Lt. Nathan Forbes, USN; and even though he was trying to put a stake in our ‘hero’, Barnabas, in order to save his own skin, he was trying (on some level) to do the right thing too. Another (sort of) blooper is that Barnabas cooks up a cover story that Natalie had to leave suddenly to go to Paris. Paris in 1796 is the very last place a French countess would be rushing off to. As johnny-come-lately said a little higher up any extra Nathan Forbes is a good day. You did such a lovely wrap up post for Joel Crothers earlier on. Thank you so much for posting the interview that mentions that he truly enjoyed playing Nathan Forbes. I think it showed. We lost Joel too young. I loathed the Johnny Depp “DS” movie, but recall one interesting (in the context of this post) aspect. 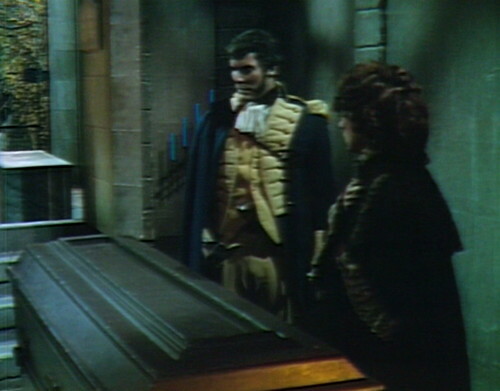 When “Barnabas” was back in the coffin for about five minutes, he had no idea of how much time had passed; he thought (iirc) it could have been a century when it was a mere few minutes. Some sort of timeless, suspended state was evidently what was experienced when inside the coffin.